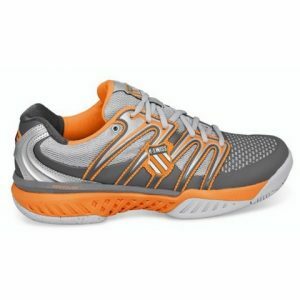 The K-Swiss Big Shot tennis shoe is the fastest tennis shoe on the market. A faster, wider, lower, more stable, more durable, more everything tennis shoe with data that proves it’s the best tennis shoe on earth.The shoe is designed to offer unrivalled durability and comfort, featuring superb metatarsal rigidity and spring via the head propulsion plate. Designed with the K-Swiss 70 system a combination of technologies designed to deliver the highest levels of performance tennis products!The featured SuperFoam technology is a space aged energy return foam that resists compression and lasts longer providing cushioning and comfort. The Aosta 70 rubber compound outsole features lateral support outrigger providing further comfort and support.Fitted with K-Swiss Draguard technology, located in high wear areas of the toe and heel offer increased abrasion-resistance. Durawrap technology provides an extra line of defence against excessive toe-dragging . The Midsole is fitted with a superb arsenal of technologies. Guideglide technology, a unique midsole construction that centres the foot from heel-to-toe, ensures a more comfortable and stable ride and K-EVA specialized EVA provides maximized cushioning and enhanced durability. Y-beam technology, a mid-foot support structure, anchors the arch area with a TPU injection component.The Featured heel grip lining, manufactured from interlocking fibres, grip the sock to help prevent slippage. Fitted with K-Swiss Stay-tied lacing system. This technology acts as a catch to ensure the laces remain tied, even during the toughest of games.